Following the highly publicized deaths of Eric Garner and Michael Brown at the hands of white local law enforcement officers, along with the subsequent failure of the justice system to address this repugnant state of affairs, it has become essential for left-legal activists and advocates of social justice to begin crafting a model of criminal justice that is capable of withstanding the bias of perceived class, gender, and racial supremacy. Further, it seems necessary to express these ideas in a manner that is amenable to implementation, rather than conveyed in the abstract terms of bourgeois ideology. Such a design of legal structures and procedures can be deduced from the concepts provided by Karl Marx and the various leftist practitioners and theoreticians that have followed in Marx’s footsteps. In order to fully understand what envisioning a Marxist model would entail, it is necessary to lay the foundation of the Marxist legal tradition in its historical context, and then in explicitly Marxist terminology as such terms may relate to crime and criminal justice. We will journey first through a brief history of Marxism as it relates to law and the legal systems purported to have existed in the name of Marx, particularly the Soviet legal system. Following this historical analysis, we will consider the specific tenets of Marxism and how those concepts may guide us in constructing an authentic Marxist model of criminal justice. Next we will implement these tenets in laying out a critique of each of the three phases of the American criminal justice system: 1) the police, 2) the courts, and 3) the prisons. Finally, we will conclude with an attempt at providing brief recommendations for constructing a Marxist criminal justice system. What follows is intended to be an introductory overview of these concepts and systems. 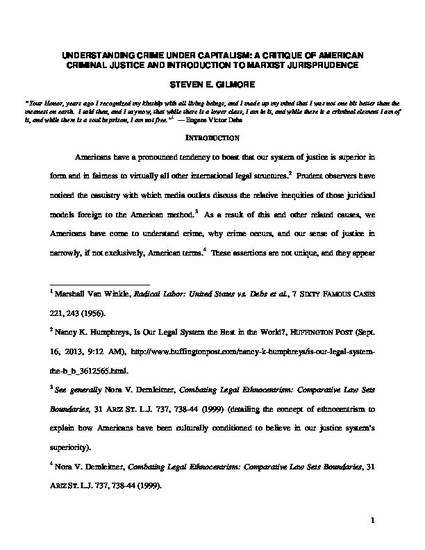 Steven Gilmore, Understanding Crime Under Capitalism: A Critique of American Criminal Justice and Introduction to Marxist Jurisprudence, 3 Access to Just. J. 4 (2016).